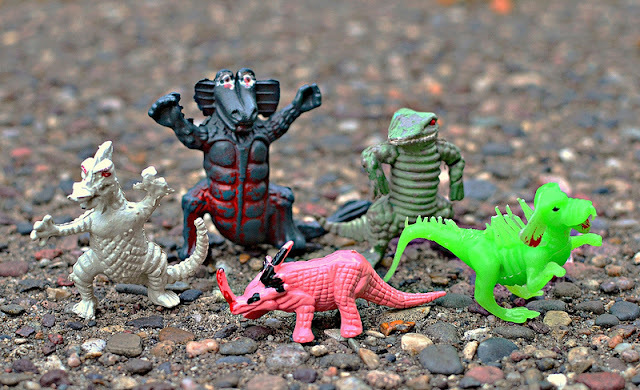 Little Weirdos: Mini figures and other monster toys: Plastic dino monsters unite! Why oh why do I like cheap-looking toys so much? These plastic dino monster things, often referred to as "Chinasaurs" by some fellow toy geeks enthusiasts, are badly-painted and just questionably produced in general, yet for some reason they will keep a permanent place in my figure collection. I did a post on them a while back, but since I recently got a new one (green dino-dog-dragon dude on the right), I decided to get a group shot of all the different plastic dino monster sculpts I own. For more pics of these guys, check out my Chinasaurs set on Flickr. Love those things too - I've had four of those five for as long as I can remember, but the one second-from-right... Still haven't managed to get hold of that one. What an awesome post, thanks for sharing. I'm kind of envious of the Owlbear--that one must have been a very short-lived inclusion! He is the tough one to find. In the 11 months that I have been watching auctions on eBay, only 2 came up...and you saw what the first one went for. Fortunately the second went for $7, which is about the usual price I paid for these guys. I don't think I'd ever even seen that one before your post. I'll have to keep an eye out! The other day I picked up a set of "Realistic Dinosaurs" containing the larger bipedal lizard man and a bulette. Keep an eye on the Rite-Aid toy isle if you're still looking for a bulette. Also, now I'm curious. I read that these are likely based on Ultraman kaiju, but I'm not at all that familiar with Ultraman. Which kaiju are these guys based on? Cool, it's nice to know these are still showing up! They must take some record for longest-available toy sculpts. I wish I could answer the Ultraman question. I'm actually not sure.